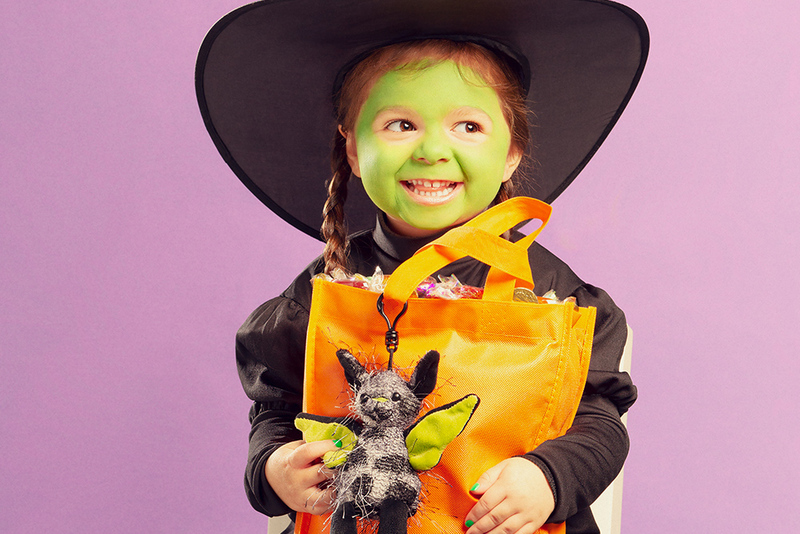 “Double, double toil and trouble; fire burn and caldron bubble …” The spookiest season is upon us! 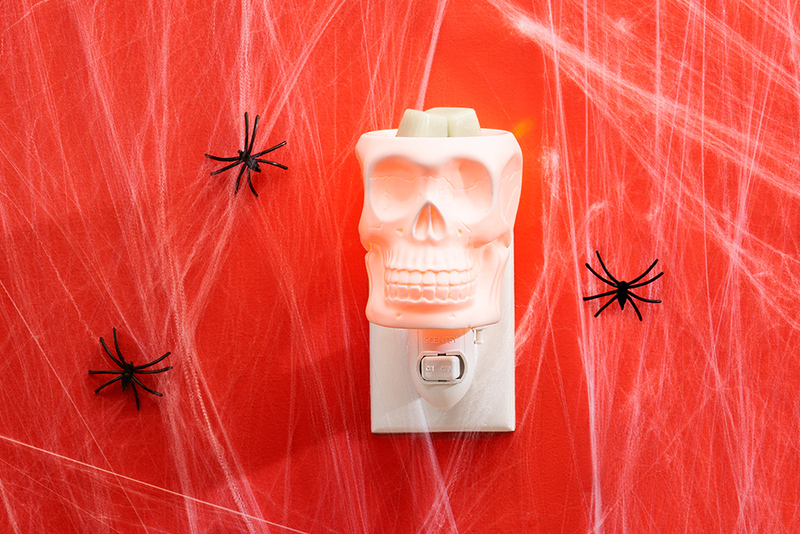 Whether you celebrate All Hallows’ Eve by going door-to-door for candy, dressing up for a costume party or binge-watching horror flicks, it’s no wonder Halloween is the second-biggest holiday (after Christmas) in the U.S.
And while there are loads of ways to celebrate Oct. 31, you’ll want to make sure your house is Halloween-ready for any ghouls or goblins that might pop by. Sure, you could hit a big-box store for premade decorations, but the real fun is in unleashing your creative spirit to produce haunting adornments you’ll cherish for years to come. Start saving those gallon milk jugs now! Wash and dry thoroughly, then draw spooky ghost faces in black permanent marker. Fill with white holiday lights or LED tea lights to decorate your porch or walkway in a ghostly glow. Round up a coven of inexpensive black witch hats, lightweight LED light sticks and some fishing line. With a sewing needle and about 2 to 3 feet of fishing line, string a light stick inside each witch hat, piercing the line through the tip of the hat. Tie a loop around the exposed end of the fishing line and hang it from your front porch awning with a Command Hook. Repeat for each hat. All you need are a dozen black balloons and a roll of black crepe paper streamers to create six eerie arachnids. Blow up six balloons to full size; blow up the remainder slightly smaller. Tie a smaller balloon to each of the larger ones. Cut eight strips of streamers (about 2 feet each) per spider to create the legs and tape them to each spider body. Drape and tape the legs and bodies of each spider across your front windows, garage door or porch posts. 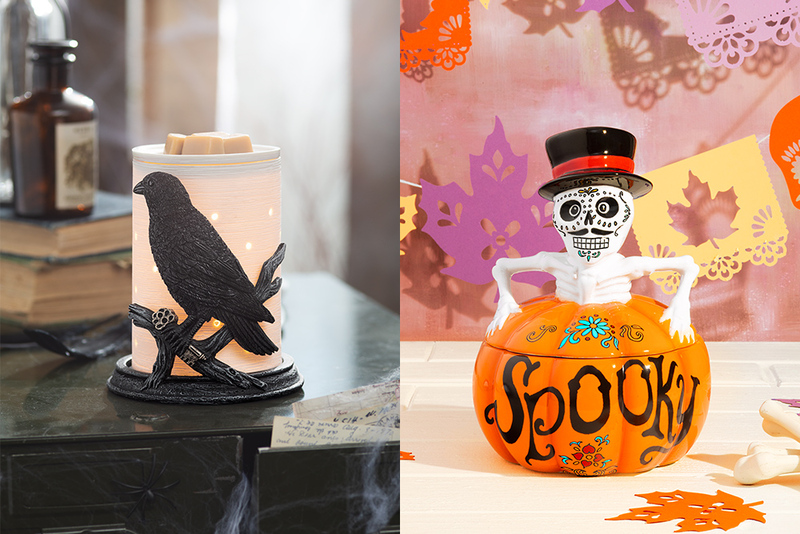 Don’t forget to trick out the inside of your home with ghoulish delights from Scentsy’s Harvest Collection, including the legendary Raven Warmer Wrap, Dearly Departed Mini Warmer and skeletal Spooky Warmer. Pair any of these warmers with returning Fall & Winter fragrances such as Autumn Sunset, Farmstand Pumpkin and Pumpkin Roll,or find a favorite among our New Releases, including Autumn Hearth and Porch Pumpkin. Homemade decorations and Scentsy fragrances make it easy to get monstrously creative with your theme. Contact your Scentsy Consultant or visit their Personal Website to shop the full Fall/Winter 2018 Catalog. Don’t have a Consultant? Find one near you at scentsy.com. Separator image Posted in DIY, Home Décor. Make a fall bucket list! Always get your favorite Scentsy Bar! Best Harvest Collection YET! Thank you Scentsy! We’re glad you’re loving it! This was so great! Can’t wait to try some of these. Thanks!!!!! !